Note: This competition is only open to former participants of ECA's Professional Fellows Program who participated in the program between 2010-2014. The U.S. Department of State is pleased to announce the 2016 Professional Fellows Program Alumni Impact Award which recognizes the positive contributions made by Professional Fellows Program (PFP) alumni. The Professional Fellows Program, the flagship program of the Professional Fellows Division within the Office of Citizen Exchanges in the U.S. Department of State, brings approximately 450-500 foreign fellows to the United States to participate in four-to-six-week long fellowship placements while sending approximately 250-300 American fellows on reciprocal fellowships abroad. The fellowship has succeeded in motivating these fellows to make a difference in their home communities through their post-Fellowship work. 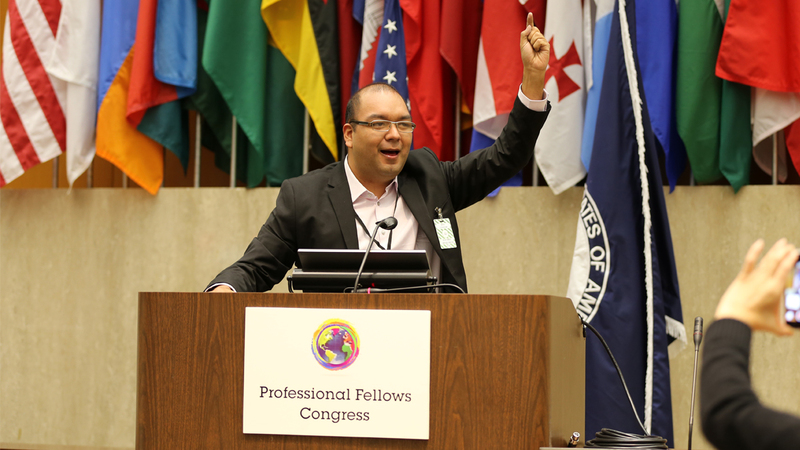 The U.S. Department of State will select foreign and American alumni of the PFP to be honored during the 2016 Spring and Fall Professional Fellows Congresses (PFC). The awardees will be selected based on the positive impact the alumnus has made to his or her community, workplace, and/or country. Specifically, awardees will be selected according based on their ability to demonstrate how their participation in the PFP enhanced their ability to make a deeper impact on their community, country and/or their country’s diplomatic relations with other countries, including the United States. Applicants may apply in coordination with, but separately from, their American/foreign exchange participant. Awardees will be selected independently, but the impact of the collaboration between pairs of participant will be taken into consideration when applications are reviewed. The Alumni Impact Award winners will be flown to Washington, DC to take part in the PFC, the concluding segment of the 2016 PFP. In addition to being publicly recognized for their achievements, the Alumni Impact Award winners will be asked to make a presentation at the PFC and will be provided the opportunity to organize, lead, or moderate a session during the PFC. Applicants must complete the online application by 11:59 pm EST, Friday, February 26, 2016. After completing the application form, the applicant should email their resume or curriculum vitae, and two letters of recommendation to PFPAlumniAward@state.gov. Please include “PFP AIA 2016 – Name, Country” in the subject line of the email. The letters of recommendation should be from 1) the applicant’s American grantee organization or host organization from their fellowship and 2) a professional reference from the applicant’s country that talks about the impact of their work (limit of no more than 100 words). Both the online application and the supplemental email documentation are required for the application to be complete. A selection committee within the State Department will determine the winners. The top-ranked candidates will be contacted in March for an interview via phone or Skype. Announcement of the selection is anticipated to be made by March 31, 2016. The award covers the following expenses: roundtrip airfare to Washington, DC, health benefits under a J-1 visa for foreign awardees, meals and hotel accommodation at the PFC.